Snacks throughout the day are part of a healthy diet – as long as you choose the right pick-me-up. Available in 10 yummy varieties, Welch’s Fruit Snacks provides a mouth-watering chew and taste to keep you satisfied throughout your busy day. Tuck them in to your little one's lunch box or your gym bag for great on-the-go snacking. They are made with real fruit & fruit juice, all the offerings are gluten & fat free, contain no preservatives and 100% daily value of Vitamin C.
And if you like Welch's® Fruit Snacks, you're going to love Welch's Fruit 'n Yogurt Snacks, featuring centers made with Real Fruit and surrounded by Creamy Yogurt. Welch's Fruit 'n Yogurt Snacks contain 100% of the recommended daily value of Vitamin C, 25% of Vitamins A and D, 10% Calcium and are low fat. Welch's makes some really tasty fruit snacks and they were definitely satisfying when I had a little sugar craving or wanted to munch on something fruity! I love the new flavor - Tangy Fruits! I love sour or tangy snacks and these are really good! 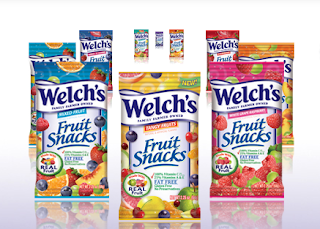 Best of all, all fruit snacks from Welch's are made from real fruit & fruit juice, all are gluten & fat free, contain no preservatives and 100% daily value of Vitamin C. Those are some great added benefits to an already tasty snack! Next time you want a tangy or fruity snack, turn to Welch's Fruit Snacks! 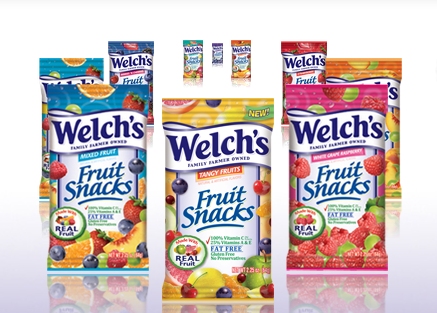 Buy It: You can purchase Welch's Fruit Snacks at all local retailers. You can look here for a list of retailers near you!